I’ve talked about two of my Muses thus far: Lindsey Stirling, who is a successful musician, with concert tours and a few million followers on YouTube, and Karliene, who is thus far a small-timer, but has the artistic chops to, I believe, add something meaningful and beautiful to the culture of our favorite stories, much like Enya in Fellowship of the Ring. Today’s Muse is a little different. I do not envision S.J. Tucker performing large concerts or authoring music (and accompanying music videos) for Hollywood-level movies (kudos if she does). I see her more among storytellers, at festivals and conventions, rather than in a huge stadium. I imagine her traveling the land, singing stories to people, singing about people and her own experiences. She’s more of a bard than a pop culture icon. I’m going to take a moment and emphasize what I mean by that. Some people, those who dream of big stages with big bright lights and millions of adoring fans screaming their name and begging for an autograph, think that’s what matters. They see the flash, and confuse it with substance. It’s a common mistake, but a mistake nonetheless. S.J. Tucker’s work is much more substance than flash. 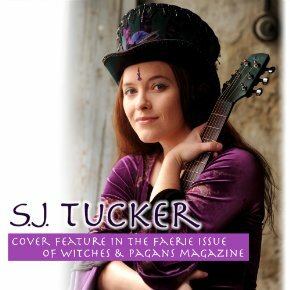 With a slew of fellow artists she’s collaborated with, Tucker draws the inspiration for her songs from her own life, including social activism, mythpunk fantasy, and neopagan spirituality, commonly called “wicca.” I won’t lie, part of my personal enjoyment of her music is the glimpse I get into wiccan/neopagan culture, as I enjoy learning about cultures other than my own. That is what makes this world so rich with diversity, after all. I thoroughly enjoy her “mythpunk fantasy” music as well. She’s collaborated more than once with Catherynne M. Valente, mythpunk author, on book/CD crossovers. They’ve performed live demos together to promote their work. Valente writes the novel, drawing on folklore around the world and giving it a little twist, while Tucker composes the music, both artists inspiring each other in their work (Valente was inspired to create a fire-dancing character by Tucker’s fire-dancing, and Tucker then wrote a song about said fire-dancing character), and then they go on tour promoting it. When I first heard Tucker reading an excerpt, followed by a song, I just had to get the book it was based on! Oh, I would love it if they had the audiobook version with Tucker reading it! I also enjoy Tucker’s telling of stories drawn from real life, such as “Mandolin Holy Man,” “Go Away Godboy” (it was to send negative energies in the direction of her friend’s crazy “I am God” stalker), and my personal favorite, “Valkyrie Daughter.” That last is drawn from a true story of loss, albeit adapted to become a mythical story. It sings of how a man’s soul is healed in the wake of such pain as the loss of his beloved daughter, and the real-life counterpart, I believe, found a measure of healing through this song. That, right there, summarizes what I find to be most beautiful about Tucker’s music. Beauty is more than a glamour, more than lights and stages and shouting. It’s more than what you see. Beauty, as I define it, is a force which uplifts, inspires, and heals the human spirit. It is the ultimate criteria for me, to determine what something is worth. Between the glimpse of a culture I know little of, and the fantastic stories she tells, and the stories drawn from her life, told to heal the human soul, S.J. Tucker’s music is most beautiful to my ears. And that is why I call her a Muse. So go visit her website, here! This entry was posted in Muse-ings and tagged Catherynne M. Valente, S.J. Tucker, SJ Tucker. Bookmark the permalink.